2016 was my first time attending Dragon Con. It was Dragon Con’s 30th anniversary, and being there among 77,000 of my fellow con goers was a pretty bewildering experience. Despite being overwhelmed, I learned some valuable lessons about what you can do to make your Dragon Con experience the best it can be. You’re going to have a great time. Take these points to heart, and you can take if from great to amazing. Dragon Con is massive. There are fifteen to thirty different things going on at the same time at any given moment. Panels, parties, shows, and events are happening all around you. You cannot attend them all. So divide the schedule into categories of what you wouldn't mind seeing, would like to see, and absolutely have to see. The Dragon Con app is invaluable for this. Install it on your phone, and browse to see what all is going on. Schedules get loaded about one week before the con starts. You can browse by time, speaker, or track. Map out the events you want to see, and account for time to move between events and get in line for bigger panels (more on this later). If there is something you really really want to see or do, plan around that. You aren’t going to miss anything you want to see unless they are both on at the same time. Don’t forget to factor in food time. You aren’t going to enjoy the panel if you’re hungry. I know. I’m contradicting my first point. Hear me out. When you are planning out your Dragon Con experience, set aside some time where you don’t have a plan. Do a bit of wandering. There is so much to see. Cosplay is a huge deal at Dragon Con. Take some time to check out the Cosplayers in the hotel lobbies, on the street, and walking around. You are going to see some amazing stuff. There are some very dedicated Cosplayers at Dragon Con. Appreciate them. There is also a nifty button in the Dragon Con app called “What’s Happening Now”. During your unplanned time, click on it. Wander into a panel you know little to nothing about. Experience something you hadn’t planned on. There are tons of very passionate people doing some very interesting things in fandoms of all kinds. You may find a whole new thing to geek out about. You are going to need a lot of patience at Dragon Con. As I mentioned above, you’ll be there along with 77,000+ of your fellow geeks. It’s going to take you a long time to get from place to place. You are going to spend a lot of time waiting in line. You’ll have to make your way around people stopping mid stride to take pictures of someone in cosplay (just don’t stop in the habitrails whatever you do). Just roll with it, and you’ll be fine. When making your plan, make sure you factor in travel time from event to event. Just because the next panel you are going to is in the same hotel doesn’t mean you will get there quickly. If you are moving from one hotel to another, travel is going to take even longer. As for lines, they do not start forming until one hour before the panel starts. Don’t show up too early. It doesn’t guarantee you a good spot in line. Just get there, get in line, and make a few friends while you stop for a moment and wait for the next big thing. One more point of patience: Your phone connection is going to be awful. You’re competing with 77,000 phones for the local towers. It’s slow. Be patient. It’s doing the best it can. Wear comfortable shoes. Remember all that walking and standing in line? Yeah, you want something with lots of cushion to ease all the stress you’ll be putting on your poor feet. Stay hydrated. Carry a water bottle with you. There are free fountains and water stations everywhere. You have no excuse to get dehydrated. Drink water when you’re thirsty and please don’t pass out or die. Bring battery backup. Your phone is going to drain its battery very quickly as it struggles to complete for a connection. Bring a portable battery pack to recharge, and keep your phone in airplane mode when not in use to conserve power. Try new things. There is plenty of local cuisine, libations, and sights to take in. Make an effort to try something you haven’t before. It’ll make your adventure more memorable. I was in Atlanta, Georgia this year for Dragon Con 2014 my first time attending. I meet-up with my friends from the Geek I/O Network: CJ, his wife Rachel, Jared his wife Elisha and Jarred Azevedo appeared to hang out. I had a amazing time at Dragon Con with taking in all the tracks that I was able to attend to all the cosplay and other activities going on around me. First day was a bit rough just trying to get myself situated to being a new city. First thing I can tell you about my first experience at Dragon Con is there is a lot of walking in high humidly and standing in line for tracks. I could not turn my head anywhere at con and not see some in in some sort of cosplay it was amazing. There was a great mix of cosplay from all different types of media like comics, movies, video games, tv shows, cartoons and much more. Walking around the I noticed that everyone was very friendly. I felt that we all shared a common interest that we all love our own bit of the whole nerd/geek culture to be able to talk about it openly with the over 60,000 attendees at Dragon Con. This being my first Dragon Con I mostly stay with my friends who knew the layout a bit better than myself. I was able to meet a lot of host of the podcast I listen to at home like Tom Merritt, Justin Robert Young, Brain Brushwood, and Veronica Belmont. Most of my time was spent in the Hilton where there were podcasting tracks on building, making money from podcast and coming to terms with low numbers or that no one is listening to your podcast. Which what I got from that was if you enjoy doing your podcast and your are having fun it doesn't matter what your numbers are just keep on doing it. Next we all went our separate ways for a few hours. Next up it the FSL Tonight Championship track with Tom Merritt and Justin Robert Young. This was my first time listen to FSL and I really enjoyed it. It was sports talk radio with real fantasy teams like the San Francisco Federation and the Gallifrey Time Lords. The rest of the night I spent down stairs in the table top gaming room. I was able to join a game Zombie Dice with some people I meet there and watch a game of Lords of Waterdeep. On Saturday it was spent mostly just roamed around the Hyatt, Marriott and the Hilton. 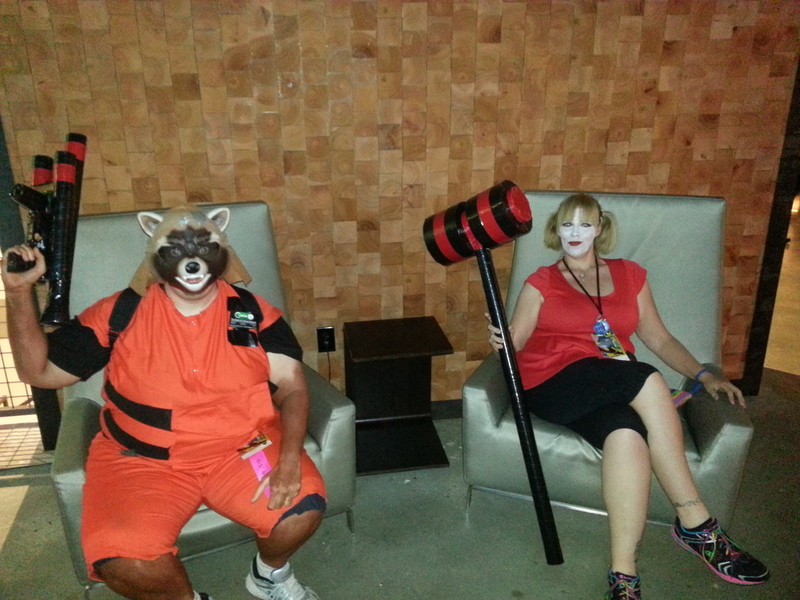 We were able to take in both Dragon Con and the city of Atlanta. Spent some time at the mall eating and just watch all the great cosplayers that walked by. We moved away from the con for dinner a nice steak house. The highlight of the night came at the Night Attack Live Show. Had a blast with Justin and Brian Brushwood. There was Turquoise Jeep, a rap session with MC Allergy, Don’t Get Brodied and the Cosplay Contest. This show could of easily gone late into to night, but at last it had to come to an end and then came the after party. The after party was a concert put on my Power Hour Ali Spagnola and Professor Shyguy. And we rocked to Shyguy’s chiptunes and then Ali’s 60 second covers. There was much fun had on that night. Sunday we went to vendor’s hall which there was much selling and buying going on. There was a bit from everything replica swords, cosplay outfits, shirts, toys, anime, comics, cards, posters. It was like you could name anything nerdy/geeky and there was someone selling it. Sunday was also the day we had planned to spend together away from the con and enjoy the city and catch a movie with our friend Jarred Azevedo. Found a theater in this very hipster outdoor mall which only had two hour max parking. Had dinner filled the parking meter and went to the movies to watch Guardians of the Galaxy. The movie theater kinda caught us all off guard. The box office on ground floor ok normal, but then you had to behind it to a single glass door to an escalator to what you say a second escalator which took us to the front of the snake bar and screen rooms.